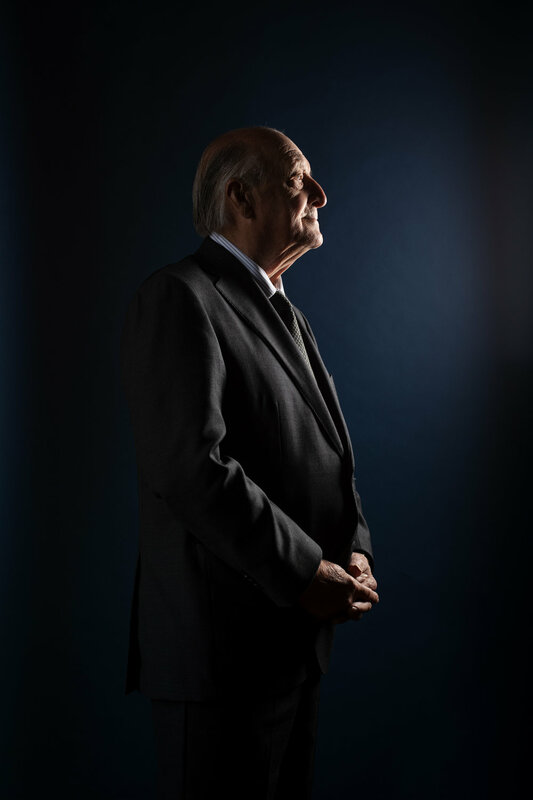 I've had a few of chances to photograph Sir John Hall but never been happy with the results until my recent cover shoot for North East Times magazine. Sir John for me is a personality who is perhaps unique in the north east (or even unique to the north east) who has not only shaped the physical landscape through his businesses but also the cultural landscape with his passion for the region and his involvement with NUFC & charities. He's always been high on the list in my quest to document the North East's defining characters so trying to get a picture which will stand the test of time has become a game of cat and mouse between us (well, on my part only. Sir John's interest in my portfolio of portraits is minimal at best I'd suspect.). That said he has always been accommodating and I've gotten two or three what I would call 'grabbed' portraits against white walls at events/press calls etc. All acceptable, passable pictures but nothing special. My next chance came around a year ago with a shoot with him at Wynyard gardens, unlike times before I had him to myself for 10 minutes, helped by a chance to have conversation with him and Sarah his granddaughter vouching for my professional abilities we had a successful shoot where I was pretty satisfied with the results. Sir John liked the pictures too and asked for copies. My favourite from that session is shown below. After that session I couldn't get the idea of a silhouette cameo style picture of Sir John out of my head, I had the idea for it before the Gardens shoot with a landscape of Wynyard in the background but the light/time constraints didn't allow for it. So I was delighted when we decided to feature Sir John on the cover of North East Times and he agreed to another session for the June 2018 issue. Often before a shoot, especially when I have a clear idea of what I'd like to get or I feel it's a big opportunity for a defining picture I'll get quite anxious and play the scenario over in my mind. I knew that Sir John was very accommodating in the past but also that he had the potential to simply not be in the mood to be photographed, or wanting to just do a quick couple of frames before wrapping it up. I felt it would hinge on me getting along with him in conversation like the session before. Thankfully we pretty much picked up where we'd left off last time. In reality it couldn't have gone better on the day, Sir John arrived in good spirits and looking really healthy too also better on his feet than I had remembered a year earlier. I had ample time to set up as Ali (North East Times editor) conducted the interview. I decided to set up a blue paper backdrop, partly because I remembered his blue eyes and partly a nod to his conservative political leaning and business success during that 80's/90's tenure which has been well documented. This was essentially my 'safety shot' using flash to create my cameo image by just clipping the light past Sir John (this would transpire to be the cover image used in the end). Everything else would be shot using available light from the massive windows in Wynyard Hall and wherever else he was prepared to have a picture taken, I had a couple of scenarios planned. We also took along a rose as reference to his love for gardening and the flowers. Ali picked them up from a florist the day before and we opted for white roses (I was worried red would look too romantic!). The idea was to have him holding one. As the shoot progressed and we talked about photography, his accomplishments, his family and estate. It became obvious his mind had turned much more towards his own legacy and how he would be remembered by future generations. He mentioned how important to him it was to get copies of all the pictures for a document he had been creating about the family history and that of of Wynyard, I explained that a great portrait of him was important to me as I try to document the times we live in and people of the North East who are shaping the region. We hit upon a common cause. It's always great when your subject suggests an idea for an image, especially when its something you'd have asked them for anyway! They've bought into the process of making the images. The holy grail of portrait photography! Sir John's idea was to take us in his car to the other side of the lake to look back at Wynyard Hall from there. The view is not accessible to the public and it's his favourite spot. He knows every acre of the estate. After asking about the view I learnt that he'd never been photographed there before. The shot seemed obvious to me, his face not visible but rather looking across Wynyard. A man taking stock of his kingdom. The miners son who bought the colliery owners house. "The boy done good" I decided to exclaim, I think my joke tickled him and he looked proud of his accomplishments. The session made me think a little about the dynamic of a portrait. In essence it's a collaboration, in this instance we both came to the shoot with a similar goal, to capture a picture which describes Sir John at this point in his life. I really admire him for collating his life, in pictures, cuttings, and videos for future generations to make sense of the time in which he lives and how he got to that point, I also like his awareness that the present is a fleeting moment which without being documented is knowledge lost. I've just received a message as I finish writing this saying he really enjoyed the article and pictures and for me to call him next week to speak about getting him the images. Our respective scrapbooks continue!